Breaking the Bank: Secret's out! Easter weekend was a great fishing weekend. We went into the striper run at full force, expecting limits and nothing less. Unfortunately the striper weren’t having it! In fact, many anglers that were around us were saying the same thing but we all decided that within the next week the striper count should pick up. Turns out our “secret” fishing hole isn’t a secret at all! We have what we thought to be a secret fishing hole out on the sac in Colusa. All last summer and winter, we hit that hole and rarely would we see anybody out there. All of a sudden at the beginning of the year we started seeing more and more people coming to ask us if we had caught any out there. This weekend we had four different anglers come out to check on the spot! Secret’s out! Anyway, we used Anchovies and sardines with sardine pro-cure oil. There were bites but nothing major. While my dad was out of commission, his line got a bite, I ran over to get his pole, set the hook and brought up what I imagined would be a nice stripe! Turns out it was just this fat little 13 in channel cat which we ended up giving out to a group of anglers who were next to us and hadn’t caught anything. Wouldn’t you know it as soon as we left, they moved over to our spot! Sunday was a good fishing day! 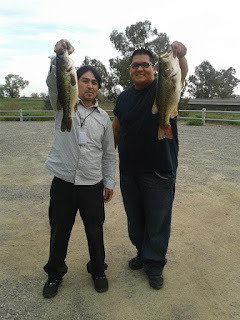 After church we thought we might as well chase some bass in West Sacramento. 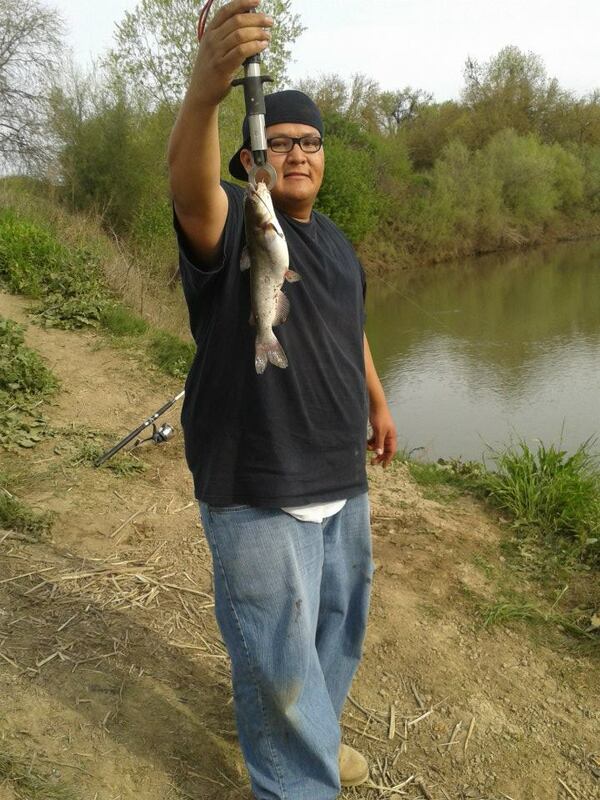 Instead we ended up trying Putah Creek which some fols were recently telling me held a good amount of bass. Turns out they were right! There were a lot of bass anglers out that day and we ended up catching these two monsters! Pops caught his 17.5 in 3 ½ lber on a Yum Rubber Crawdad. I caught my 20 in. 5 lber on a wacky style rigged lucky strike black rubber worm. Which brings me to my question of the day… Some guy in a discussion board, made a snide remark about me keeping this female largemouth. I thought to myself, “I didn’t know I wasn’t supposed to?” What’s the etiquette when it comes to female bass? You see, I don’t know how to tell the difference between the two. My fat bass ended up being fat with eggs! I felt bad because I feel like I deprived that creek of future generations. Then at the same time, I consider myself a hunter/gatherer and everything we catch, we keep because we eat it! We’re not the catch and release type unless they are below size limit or prohibited for any other reason. Well anyways, Seasoned anglers, have grace on me if I broke some sort of etiquette or rule, but please let me know if I did something wrong!? Newbies, I’ll let you know what the answer is once I get it!